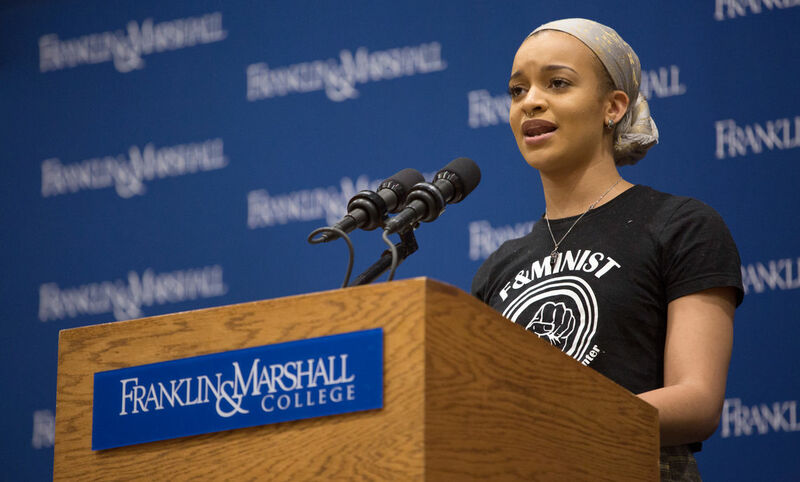 Hundreds gathered April 11 for Take Back the Night, an annual campuswide push to end gendered, racial, and sexual violence at Franklin & Marshall College. Homemade protest-style posters covered the walls of Mayser Gymnasium, reading, “Don’t ask me to smile,” “All bodies are good bodies,” “Gender justice includes trans folks,” and more. At the start of the event, Chelsea Reimann, director of the Alice Drum Women’s Center, which organized the event, shouted, “All human beings have the right to be free from violence!” eliciting a call and response from the audience. “Take Back the Night is an internationally held march and rally that was initially intended to protest the violence women experienced while walking in public at night. This movement has now grown to encompass all forms of violence against all persons,” Reimann said. 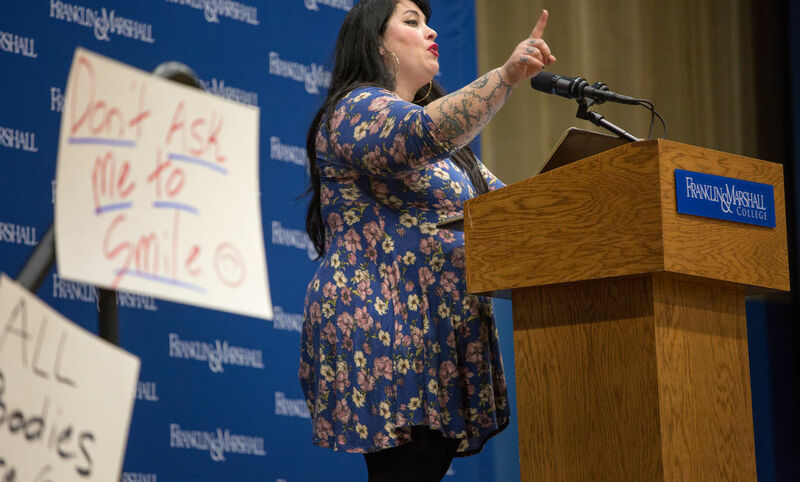 The event featured a performances by Bronx native Keyla Ynoa, a junior and member of the Women’s Center board, and by Chicana poet and activist Rachel McKibbens. McKibbens is a nine-time National Poetry Slam team member and the author of four collections of poetry. “I’m a survivor in training,” McKibbens said. She teaches creative writing and gives lectures and performances across the country as an advocate for mental illness, gender equality, and victims of violence and domestic abuse. “Rachel’s work often sits in the brutal intersections of racism, misogyny, and homophobia, but her poems also seek to reclaim the human experience by naming what hurts and what haunts. She also brings generosity, humor, irreverence, and, most of all, she speaks truth to power,” said Reimann. Following her performance, attendees took posters and marched across campus with the African Drumming Ensemble, chanting, “This is what democracy looks like.” The march culminated in an outdoor “speak-out” in which candles were passed around and a moment of silence was honored for all victims of violence. Members of the community called attention to acts of injustice, violence and sexual aggression. After the speak-out, the group traveled to the Philadelphia Alumni Writers House for pizza and fellowship.